Blondie and Brownie: Get Your Cherry Pie Fix at Four & Twenty Blackbirds Before It's Too Late! 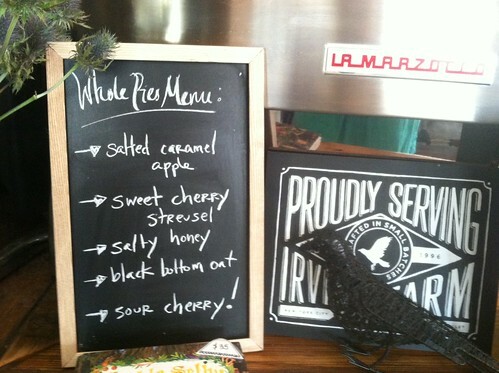 Get Your Cherry Pie Fix at Four & Twenty Blackbirds Before It's Too Late! Yesterday I made my first major solo outing with two kiddos in tow for the baby's check up and we celebrated with pie--it seemed a fitting thing to do since Lil B made his very first Four & Twenty visit when he was a newborn, too. Let me just put it out there that I ADORE sour cherry pie. 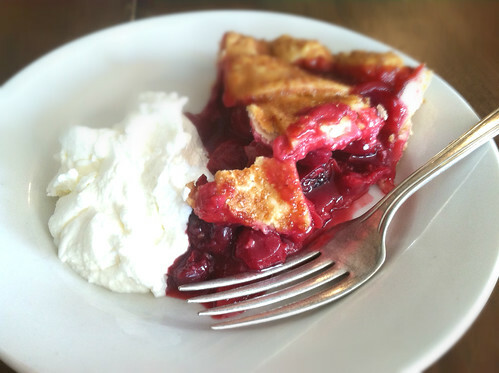 In fact, sour cherry pie ranks among my top food memories--the specific pie that I'm thinking of was made by my high school boyfriend's mom with cherries from their own yard. For years this pie has been my white whale--unmatched by any pie before or since...until now. The sour cherry pie from Four & Twenty Blackbirds is certifiably awesome. So many cherry pies are, in my humble opinion, ruined by over sugaring and the addition of almond extract. Cherries don't need almond extract to taste great! They are naturally delicious and that's what's so wonderful about this pie. The Elsen sisters let the sweet/tart flavor of the sour cherries shine. And their buttery crust is lovely and flakey as always. Emily Elsen told me that they were up at Wilklow Orchards checking out the cherries and they are in their prime now, but going fast. She predicted they'd have sour cherry pie for perhaps the next week and sweet cherry pie maybe a bit longer and that will be it! If you love cherries like I do, don't tarry, go get your slice or whole pie asap. They don't always post their daily offerings online so it's best to call in advance to see what's on offer if you have your heart set on a certain pie. For pie lovers who can't hit their Brooklyn shop, The Four & Twenty Blackbirds cookbook is coming out this fall and is available for pre-order. I can't wait to get my hands on a copy! This pie looks great. We'll have to try this out soon.